I witnessed something yesterday that showed a savvy use of media, connections and community – something that illustrates why nimble upstarts are gaining power on the web. With about 10 people in the chat room watching the interview, Andrew simply left the camera on and began chatting with us. He answered questions we came up with, he talked about how he was still trying to make today’s interview happen, and talked about topics he was following on Twitter. One of the topic he brought up was a back-and-forth exchange on Twitter between Matt Mullenweg, a founding developer of WordPress, and Chris Pearson, founder of Thesis theme for WordPress. I’ll spare you the details, but there is a debate about whether Chris’s Thesis theme should conform to the General Public License that WordPress does. A full explanation can be found here. Then, Andrew had a flash – an idea. What if he can get both of them to call in to this live show right now. Andrew had interviewed both of them before, and was hoping he could serve as moderator for a civilized discussion. Twitter didn’t seem like the best place for the discussion, and that’s how they were currently going back and forth. Andrew sent out a Tweet to both Matt and Chris, and some of us also asked them to consider Andrew’s offer. Andrew also had Matt and Chris in his Skype address book, and noticed that at least one of them was online at the moment. Within minutes, Chris responded that he was game. Matt soon responded saying he would prefer not to. Andrew gave Matt another offer – to have a private conversation that Andrew would moderate, and if all parties agreed afterwards, then Andrew could share it with the world. A few minutes later, Matt agreed to the live interview, and we were rolling. Andrew usually does live video interviews where the audience can view him and the interviewee in two separate panels on the screen, and a chat room is below it. For this, Andrew quickly setup an audio chat – so you heard Matt and Chris, but the video was only of Andrew moderating. The discussion lasted an hour, with Andrew ensuring each person had the space to respond, and tried to ask clarifying questions to bring the two together. About 80 people were in the chat room – triple the normal amount, and news of the live show spread through Twitter and Matt & Chris’ communities quickly. Andrew’s daily session started off as a failure. The interview he was supposed to have had cancelled, after a ton of work Andrew did to set it up. He was on the video with an audience, and had nothing. Instead of focusing on defeat or ‘what ifs,’ Andrew kept himself open, and let his curiosity explore new avenues. That expression about luck is true – Andrew looks for luck, and finds it. Andrew identified a key topic at a key moment, and took action even though (I thought) it would be unlikely to pull it together so quickly. But he did, and the result was a compelling online discussion. Before the idea to call Matt & Chris came up, Andrew was just chatting with the live audience. One point he made was how surprised he was that more people don’t do what he does – interview people – because it gives you so many great connections and such a large network. Then, minutes later when he had the idea to call Matt and Chris, he knew he could reach them because he had already interviewed each of them. Andrew seemed confident that Matt & Chris would respond to him, and sure enough, they did. Both of them already knew Andrew, and already trusted him. Here they are in the middle of a heated debate, and they trusted Andrew to moderate in a live chat. That says so much about the power of what Andrew has built. Andrew has been doing these live interviews for a long time, and in doing so, has built up his skills to setup calls like this. Even though his normal interviews were two video panels, Andrew quickly setup an audio chat with Andrew on video as monitor. Watching him do this – it took moments for him to conceive the best way to do this. But from experience, I know that many people might hit a wall at that moment, and not think it’s possible to proceed simply because of their familiarity (or lack thereof) with the tools. You can listen to the discussion between Matt, Chris and Andrew here. 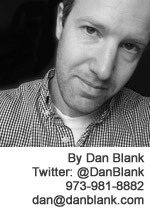 Let me know if I can help you build your community online: @DanBlank, 973-981-8882 or dan@danblank.com.